Notes: A leaning hollow tree, heavily propped. Some branches have been removed to prevent tangling with telegraph wires. Girth ft ins: 15' approx. Latest information: Sept 8th 2014 - Peter Norton: Of three yews that grow here, the significant one is close to the southeast perimeter corner. 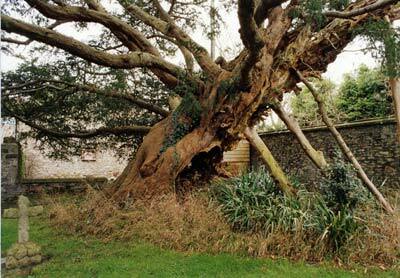 It is a hollow and fragmenting female yew, still propped, although two props lie on the ground. It is now screened by alder and holly.